The Investment Savings Calculator in Quicken 2012 enables you to forecast portfolio future values and other similar stuff. Suppose that you want to know how much you’ll accumulate if you save $5,000 per year for 35 years in a stock mutual fund that you anticipate will earn 10 percent annually. Use the Investment Savings Calculator to estimate how much you should ultimately accumulate. Click the Planning tab to display its buttons. Click the Planning Tools button to display its list of calculators, and choose the Savings Calculator. 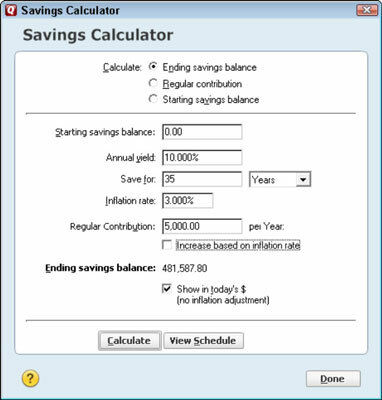 Quicken displays the Savings Calculator dialog box. Enter what you’ve accumulated as your Starting Savings Balance. Move the cursor to the Starting Savings Balance text box and then type the amount of your current investments. If this amount is zero, for example, type 0. Enter the Annual Yield that you expect your investments to earn. Move the cursor to the Annual Yield text box and type the percent. If you plan to invest in the stock market and expect your savings to match the market’s long-term return of about 10 percent, for example, type 10 (don’t type .10). Indicate how long you plan to let your investments earn income. Use the Save For text box to indicate how many time periods (years, months or whatever) you’ll save. Then use the Save For drop-down list box to select the time period appropriate to your investment planning. (Usually, you’ll select Years.) For example, if you select Years in the drop-down list box and you plan to let your investments grow for 35 years, you type 35. Enter the anticipated inflation rate. Move the cursor to the Inflation Rate text box and type the inflation rate. By the way, over the 20th century, the inflation rate averaged just over 3 percent. Enter the amount you plan to add to your investments every period. Move the cursor to the Regular Contribution text box and type the amount you plan to add. The figure shows how to calculate an individual retirement account’s (IRA’s) future value, assuming a $5,000 annual contribution. Indicate whether you plan to increase your annual contribution as a result of inflation. Select the Increase Based On Inflation Rate check box if you plan to annually increase — by the annual inflation rate — the amount you add to your investment portfolio. Don’t select the check box if you don’t want to inflate the payments. After you enter all the information, click Calculate. The Ending Savings Balance field shows how much you’ll accumulate in present-day, uninflated dollars: $481,587.80. Hmmm. Sweet. If you want to know the amount you’ll accumulate in future-day, inflated dollars, deselect the Show In Today’s $ check box. To get more information on the annual deposits, balances, and so on, click the View Schedule button, which appears at the bottom of the Investment Savings Calculator dialog box. Quicken whips up a quick little report showing the annual deposits and ending balance for each year you plan to add into the savings. Try it. You may like it.